The challenge is to complete your entry with 100 words or less, creating a story or verbal image that captures the imagination. You can enter your own entry at Julia’s 100 Word Challenge For Grownups. 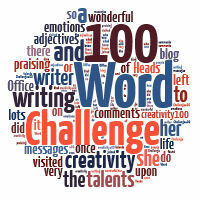 Also, be sure to visit the 100 Word Challenge for schools, where the idea originated. This is still following my Valentine’s Day theme, albeit in a twisted sort of way. Enjoy! “It wasn’t my fault” she said. “Who said anything about it being your fault?” said the detective with a sidelong look to his partner. “Really? For how long?” said the second detective. “Was he seeing anyone else?” said the first detective. Thank you brave! It was fun writing it. Yes Lisa, she does. Thanks for your comment and your visit. I noticed you’re now following this blog. Thank you for your moral support, as well. I really enjoyed reading this piece. I think this could well go the way of ‘Autumn’ – a week by week saga! We’ll be tuning in for the next episode! I don’t know, Lorely, maybe it could. It’s definitely something to consider. Thanks for the comment and visit. I hope I see you around more often. Like the others I go from being on her side to thinking she’s guilty of something, though not sure what! Very cleverly done. Thank you Claire! I think I said somewhere here in the comments that before I wrote it I was going with the idea that she was truly innocent, but then as I began to write I decided to leave that for the reader to wonder about. I appreciate your visit and hope to see you here more often. I love this use of that all too-common refrain – ‘it wasn’t my fault’! She protesteth just a bit too much methinks! Terrific journey in a 100 words. Thank you Deirdre. I’m glad you enjoyed the little dialogue. I was torn between a dialogue and a poem I also had in mind. I decided on this, as you can see, and apparently it went well. I appreciate your visit and hope to see you again sometime soon. Well written dialogue – nicely done! Thanks J. I’ve been meaning to try more dialogue for a while now. You can never get enough practice. Thanks for the feedback. Hope you’ll visit again. I like the way you have written this as a dialogue. Thanks Bel! I appreciate the feedback. I hope you visit again soon. I moved from thinking she was maybe being badgered by the police to thinking she might have something to hide. Thanks Mike. I was thinking maybe she was really innocent when I first opened the word processor to start writing, but by the time I wrote the first line I had decided to make it a mystery…I’m glad you liked it. Thanks for dropping by. Hope to see you again soon. Ah, you make me wonder so much of what exactly happened. And was it or wasn’t it her fault? Subtle clues, very effective. Thanks Judee! I was afraid it might be too subtle or give too much away. It was fun balancing between the two. Thanks for your visit. I hope to see you here again. UGH! Must give MORE!! I totally want to know everything now!! This would be a great hook for a longer story hon. Bravo! Raven! You’re back! Thanks for the visit. I know it would be but I don’t know if I would be capable of writing a mystery very well. We’ll see. Oh I totally understand that! There are so many intricacies to a mystery or whodunnit novel. It takes one hell of an author to really pull it off. Oooooh… a detective scene. It takes so few words to implicate yourself, doesn’t it? Really enjoyed it! This does leave the reader suspecting her guilt, but there is still some mystery. I can’t help wanting to know the circumstances around the event, what the event is and what the outcome will be. Well done. Ah…thanks Kat! It’s always a pleasure to hear I accomplished my intentions in a piece I wrote. I wanted to try a dialogue piece and I think everyone likes a little bit of mystery. I think she should, too. I like your subtlety (I love a little mystery!) and how this feels so whole with just 100 words. Wow! Thanks for the compliment Sparks! Coming from you, after just having read your entry for week #30, it means a lot! I was hoping it wouldn’t be TOO subtle. Clever how you take the reader from believing her innocent to believing her guilty in such a short dialogue. Thanks SJB, I also didn’t want to come right out and SAY she was guilty. I felt it went against the whole idea of the prompt. I’m glad it was noticeable.